﻿﻿Falcon is so hot, anglers can follow the smoke to the lake. ﻿﻿A constant struggle takes place along the Texas-Mexico border, with millions of dollars at stake. It’s a classic example of yin and yang, the dynamic interaction between seemingly opposite forces that are, in fact, interconnected and interdependent, one giving rise to the other. It’s not so much a struggle to win as a complicated dance of coexistence, a performance of life. Falcon International Reservoir is the stage. The anglers zooming around the lake armed with stout fishing rods spooled with strong line are more than just the audience for this performance. They are also part of the cast. They are here to do battle with fish. ﻿Jason Brudnicki caught ShareLunker No. 525 in December 2011 at Falcon. Most people assume fish simply live in water, and to an extent that’s true. But on another level water is just the substance from which fish draw oxygen. Fish use what is suspended in and surrounded by water to reproduce, feed and grow. It’s called habitat, and the forces of yin and yang produce Falcon’s habitat in an interaction between wet and dry. South Texas is often called the Brush Country, and for good reason. Rainfall is insufficient to support trees except near water. But nature’s selective hand, operating over millennia, has sifted out a variety of plants superbly equipped to endure the dry and flourish in the wet — or what passes for wet in this arid land. Those plants are here because they are survivors, and they don’t let a little thing like reservoir levels that fluctuate up to 50 feet over a year’s time defeat them. When Falcon’s water level falls, plants go on the march, following the retreating water line. You can see the evidence all around the shore: bigger, older brush higher up, smaller, younger brush near water’s edge, tops of brush (sometimes still with green leaves) emerging from the water far from shore. Those brush tops attract anglers buzzing around the lake the same way flowers draw bees. But the brush is more than an aiming point for a cast. It’s the secret to why the anglers are here in the first place. “This reservoir is like a lot of other South Texas reservoirs in that the water level is highly dependent on rainfall,” Myers says. “When we have a drought, Falcon goes down quite a bit. The water level is also highly dependent on irrigation needs downstream. The soil here is pretty productive, and when the water level stays down long enough, the brush grows up. Native Texas northern largemouth bass developed in rivers and streams, and not so long ago, a 5-pound bass would have given an angler bragging rights for a lifetime. Today a 5-pounder isn’t a decent picture fish for most anglers (unless they have really long arms and the photographer has a wide-angle lens). 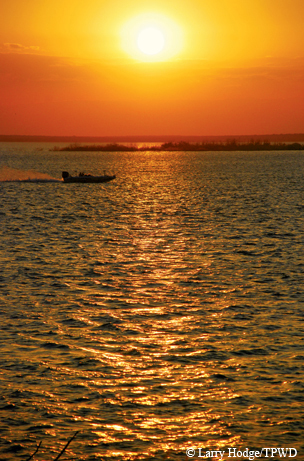 The importation of Florida largemouth bass into Texas in the 1970s, coupled with new angler attitudes that changed bass fishing from catch-and-eat to catch-and-release, transformed recreational fishing in Texas. Florida largemouth bass, which can grow to nearly twice the size of northern largemouths, gave fisheries biologists a tool to turn reservoirs built for flood control and water supply into cash cows. Freshwater fishing in Texas generates an estimated $2.38 billion in direct expenditures annually, and most of that comes from bass fishing. Reservoirs became the modern equivalent of the philosopher’s stone, transforming Micropterus salmoides floridanus into treasure. The money is in the DNA of Florida largemouths, and TPWD fisheries biologists use those genes to maximize the potential of fisheries like Falcon. Impounded in 1954, Falcon has been stocked with 3.7 million Florida largemouth bass since 1975. Some 35,000 of those were the offspring of ShareLunkers, largemouths weighing more than 13 pounds used in TPWD’s spawning program. Genetic input from those stockings provides the natural spawns that take place in the lake, the building blocks for a bass fishery like few others. In 2004, the Texas seesaw between dry and wet shifted in favor of wet. ﻿Randy Brudnicki caught this bass weighing 9 pounds 13 ounces in April 2012. Falcon enjoyed high water levels again during the spring 2011 spawning season. It takes a bass in most Texas reservoirs eight to 10 years to reach 13 pounds, the magic number at which fish become eligible to be entered into the Toyota ShareLunker program. Because summer seemingly lasts nearly the entire year in South Texas, bass in Falcon have been known to cross the 13-pound threshold in seven years. Do the math. 2004 + 7 = 2011. Jan. 31, 2011: Ky Martin of Grandview catches Toyota ShareLunker No. 510, 13.22 pounds. 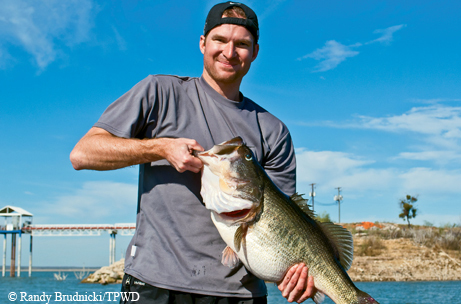 A 13.84-pounder in mid-February is followed by a four-fish outburst in nine days in March. Falcon is so hot, anglers can follow the smoke to the lake. The number of double-digit and near-double-digit bass being caught on Falcon is unknown, but its reputation for producing big bass eclipses every other lake in the nation. That reputation drew Texas Parks & Wildlife magazine Publisher Randy Brudnicki and his sons Dustin and Jason to Falcon in late December 2011. They were on a mission: to catch a Toyota ShareLunker. Cold fronts do make it as far south as Falcon on occasion, and for the first two days of their trip a north wind kept them from fishing where they wanted to. Then the south wind returned. “I knew to look for places where the south wind would blow in to points,” says Randy Brudnicki. On their last day they put in at the county ramp in Zapata and wound up fishing a ledge near the city’s water intake structure. The ledge slopes down into the water, and brush grew along it during one of the lake’s low-water times. Jason Brudnicki was throwing a crankbait (given to him as a Christmas present by Dustin) when a fish hit it just as he was ending his retrieve. Seconds later, three stunned anglers were looking at the biggest bass any of them had ever seen, much less caught. So they did what anglers in that situation do. They put it in the livewell and went back to fishing, hoping to catch another one. A few casts later, Jason caught another big fish, and they decided to weigh the two. The smaller fish was 8 pounds, but the big fish bottomed out their scale. A trip into town to a certified scale showed it to weigh 13.36 pounds. ShareLunker No. 525 had been caught. Mission accomplished. Now they had to keep the fish alive until a TPWD truck could arrive from the A.E. Wood Fish Hatchery in San Marcos — a five-hour drive — to pick up the fish. Battling engine trouble and losing battery power to run their livewell pump and aeration system, they stayed on the water all afternoon, finally turning the fish over about 7 p.m.
After that experience, Randy Brudnicki was itching for a chance to try to catch his own ShareLunker. Little more than a month later, I joined him on Falcon to see if good luck would come his way. Brush and rocks are the keys to fishing Falcon as well as a source of income for tackle shop owners. “They say if you’re not losing baits, you’re not fishing the right places,” Brudnicki says. It’s a down day for tackle shop owners. Brudnicki apparently doesn’t fish the right places and doesn’t lose any baits. He doesn’t catch the ShareLunker he’s looking for, either. His best fish of the day is 6 pounds or so, a fish that would have made the front page of newspapers 30 years ago but that took all Brudnicki’s arm length and my camera lens zoomed to its widest angle to make it worthy of a picture that day. In a follow-up trip with his sons and son-in-law, Brudnicki and the boys hit it just right and caught numerous 8- to 10-pound bass, but they still are chasing that second ShareLunker. 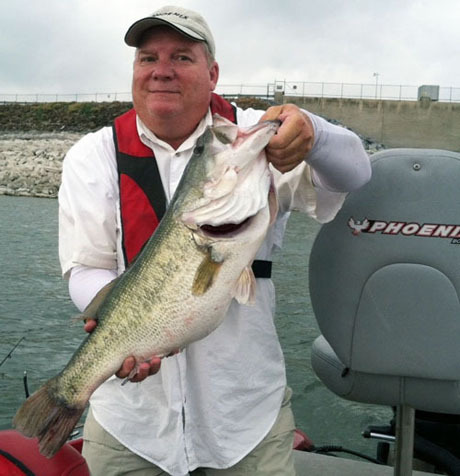 ﻿Randy Brudnicki caught this 6-pound bass in January 2012. 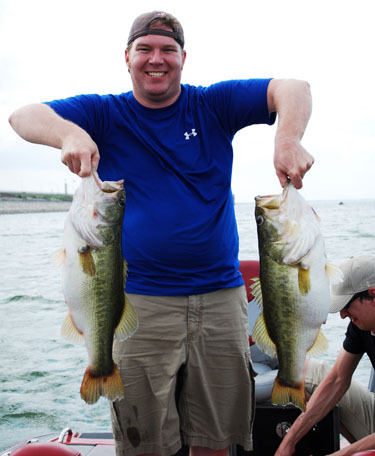 ﻿Dustin Brudnicki slammed these 8- and 9-pound-plus bass in April 2012. Gary Wingate of Amarillo did better on March 16. Whether he lost any lures that day is not known, but he did catch the largest ShareLunker of the season, a 14.39-pound fish that ate a plastic worm in 12 feet of water. And that catch begins the next chapter in the Falcon saga. DNA testing showed the fish to be pure Florida and therefore eligible to be spawned in the ShareLunker program. Just 13 days later, Wingate’s fish — Toyota ShareLunker No. 531 — produced a huge spawn of 42,157 eggs. On April 4 it spawned again, 29,263 eggs. Fingerlings from those spawns will be mixed with those from other spawns and stocked into each of the lakes that produced ShareLunker entries during the 2011-12 season. 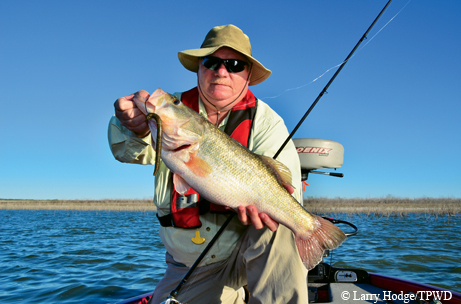 “We feel that this breeding process results in the best possible genetics being returned to the lakes, and we hope to increase the chance of more trophy bass being produced in the future,” explains Allen Forshage, director of the Texas Freshwater Fisheries Center. 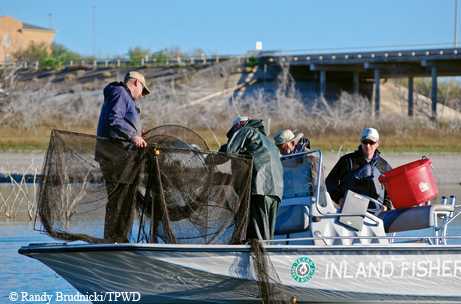 TPWD biologists conduct trap netting surveys on Falcon Lake. Forshage also notes that the main purpose of stocking ShareLunker fingerlings is not to produce trophy fish for anglers to catch. The Texas Freshwater Fisheries Center also uses some of the Share­Lunker offspring to produce broodfish for TPWD’s regular largemouth bass stocking program, which annually stocks millions of fish into Texas public waters. “In this way we are introducing ShareLunker genetics into the general largemouth bass population,” Forshage says. There is money in those Florida genes. And you can take that to the bank – on your way to Falcon. The sun sets on a great trip to Falcon. Read the story about catching a Toyota ShareLunker and other ShareLunker information in the Texas Fishing 2012 digital magazine.